"During one of my recent travels through the East of Europe, I heard about the existence in Slovakia of a huge (± 1,70 m) overtone-flute, called "Fujara". The first time I saw that beautiful flute in Austria and tried to play on it, I was at once fascinated by it's warm deep archaic sound. I fell directly in love with it and although I didn't now anything about the traditional way to play it, I set of with a friend to Slovakia, bought one there and started to play on it every day. Later I've met some local musicians playing it for me, and also I listened frequently to some recordings from the Fujara, played in purely traditional style. Although, having a deep respect for tradition, I discovered that this instrument can also be played and used in many other ways. It has a definite "meditative" quality and also a lot of "rhythmical" possibilities. Being myself originally a percussionist, I'm appreciating this very much. 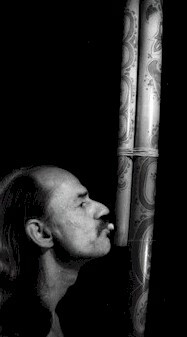 It's undoubtedly the strangest, biggest and most majestic flute of Europe and maybe it isn't wrong to say it could be our Western equivalent (although much taller, differently shaped and with another playing technique) of the world-known Japanese Shakuhachi. Traditionally it's made totally by hand from deciduous trees (elder tree, maple tree). It's a typical folk instrument and it's native home is a small region in central Slovakia, called Zvolenska country. The Fujara belongs to the solo-instruments. It consists of two main-parts; a whistle pipe and an air-pipe and there are only three holes for finger playing. In general it's also beautifully decorated and it can take up to one month to build a good Fujara." CD Fujara was recorded by Highgate Music.